Halfway between LA and Phoenix on a desolate stretch of I-10 lies Desert Center, a mostly abandoned town that mainly serves as a gas stop along the barren interior of California. 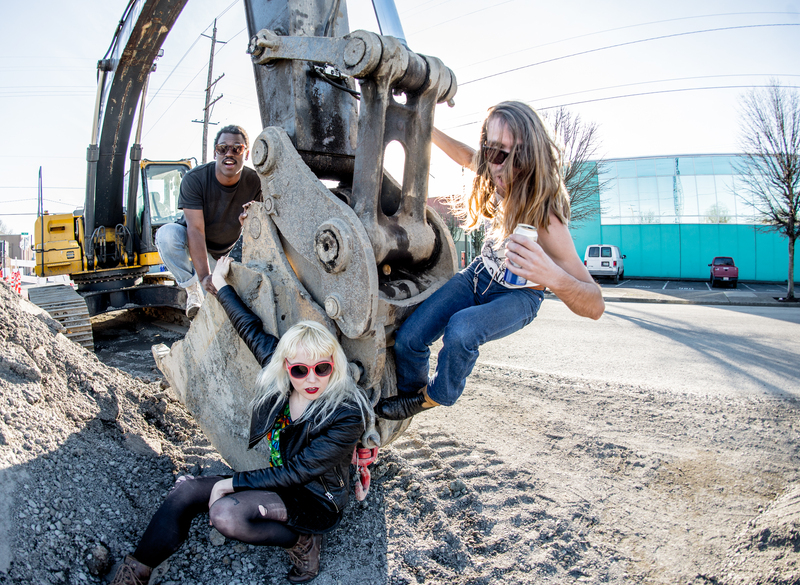 Portland punks Guantanamo Baywatch, like so many touring bands, have passed through the town countless times on their way between shows. But the town has also become a particular source of inspiration for guitarist/vocalist Jason Powell, who recently relocated from Oregon to Arizona. It may seem ironic that a band that draws so heavily from surf rock would find their muse in a location so far from the beach, but it’s not as if The Ventures were hitting the waves in their hometown of Tacoma or Shadowy Men on a Shadowy Planet were waxing their boards in Toronto. Truth is, Desert Center was the place where Powell first farted in front of his girlfriend, resulting in their use of “desert centering” as code for passing gas. 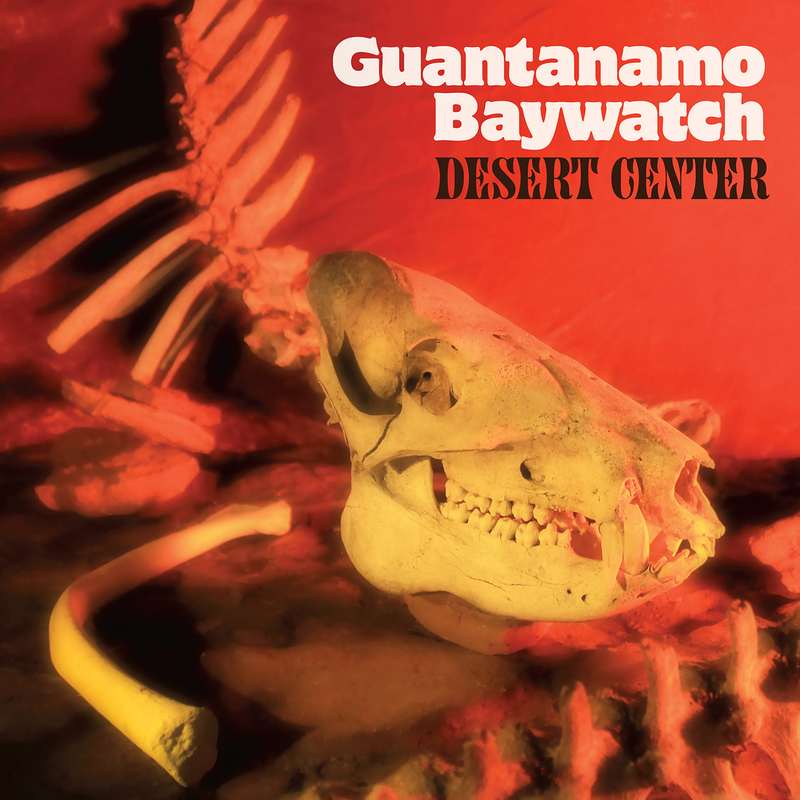 But Guantanamo Baywatch’s new album Desert Center isn’t an ode to bodily functions or breaking down comfort barriers within relationships. Rather, it’s a perfect reminder of the ecstatic rabble-rousing documentation of life in America’s lonely outposts offered up by that first wave of electric guitar pioneers. Speaking of pioneers, the album opens with “Conquistador”, an instrumental track displaying enough fretboard savvy and fiery twang to make The Challengers proud. But any notion that Guantanamo Baywatch is strictly adhering to one facet of rock n’ roll’s classic era is dispelled by the soulful swagger and unabashed pop of “Neglect”. It’s an inadvertent juxtaposition maintained through the entirety of Desert Center, with blazing instrumental nuggets like “The Scavenger” alternating with the proto-grunge and golden oldies mash-up of a track like “Blame Myself”. Like their 2015 album Darling… It’s Too Late, Desert Center was primarily tracked in Atlanta at Living Room Recording with Justin McNeight and Ed Rawls, with Powell doing the bulk of the guitar tracks on his own at Jungle Muscle Studios. While Guantanamo Baywatch initially made a name for themselves with their early blown-out recordings, Desert Center retains the raw aesthetics of a Hasil Adkins single, but has the added heft and thump afforded by a modern studio. This balance is perhaps best captured on their lead single “Video”, where bassist Chevelle Wiseman drives the tune with a thick, throbbing riff while drummer Chris Scott ruthlessly pounds his kit with a crashing clarity guaranteed to please even the most snobby analog audiophile. But ultimately, issues of audio fidelity and balancing rollicking instrumentals against straight up old school rock n’ roll were all secondary concerns. 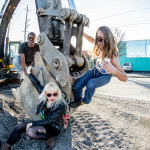 “We just want to record songs that are fun to play live,” Powell says, echoing Mike Watt’s philosophy with Minutemen where records were meant to support tours, rather than tours serving to support records. “We are always trying to push what kind of band Guantanamo Baywatch can be. It doesn’t have to be just surf or garage or whatever, ‘cause live no one cares what genre you are as long as they’re having a good time.” And that notion of thriving as a touring band, delivering the goods to people in the grimiest clubs across the country, and tapping into some collective musical past while pushing the band further is the essence of Desert Center. Also, every band needs at least one album that’s named after a euphemism for farts. Suicide Squeeze Records is proud to release Desert Center on August 4th, 2017. The album is available on CD, digital formats, and a limited pressing of 2000 copies on amber-colored vinyl with a printed insert and download code. IMAGES: To download, click above. Photo credit to Todd Walberg.